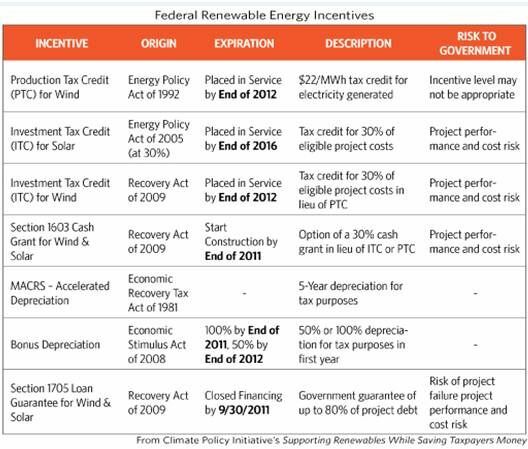 Incentive-free wind is two innovation cycles away. 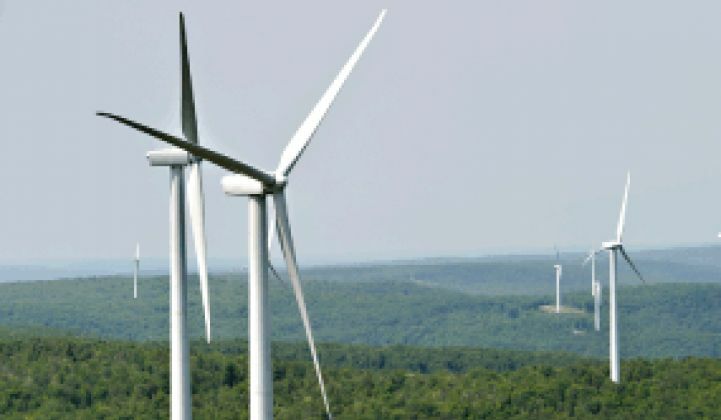 The American Wind Energy Association (AWEA) sent a letter to Congressional leaders accepting a six-year phase-down of its vital production tax credit (PTC) in return for getting it extended at 100 percent of its present value for projects started next year and 90 percent for projects placed in service in 2014. The tax credit of $0.022 per kilowatt-hour of electricity for the first ten years of a turbine’s production is estimated to have leveraged $15.5 billion in private investment in wind over the last five years. It was extended for three years as part of the financial crisis relief package of 2008 and led to growth through the recession. The PTC has allowed the industry to establish “a stable base market” on which “further market and technology innovation” over the next six years will, if the industry is properly supported, become competitive without the incentive, AWEA’s letter announced. From “detailed economic analyses and high-level discussions with industry leaders,” AWEA’s letter noted, the industry requires only a stable, predictable phase-down of its federal incentive over an adequate timeline. AWEA recommended taking the PTC down to 80 percent of its present value for projects placed in service in 2015, 70 percent for 2016, and 60 percent for 2017 and 2018. The letter was addressed to Senate Finance Committee Chair Max Baucus (D-MT) and ranking member Orrin Hatch (R-UT), House Ways and Means Committee Chair Dave Camp (R-MI) and ranking member Sander Levin (D-MI), House Speaker John Boehner (R-OH) and Minority Leader Nancy Pelosi (D-CA), Senate Majority Leader Harry Reid (D-NV) and Minority Leader Mitch McConnell (R-KY). The phase-out proposed in AWEA’s letter was essentially what was reported here November 20. The industry needs about two technology cycles for innovation to bring the levelized cost of wind generated electricity to subsidy-free competitiveness, a wind industry insider told GTM. A technology cycle is two to three years, he had said, and after a short-term renewal of the PTC was secured in Congress’s lame duck session, he explained, AWEA hoped to negotiate a phase-down of perhaps five years with Congress. 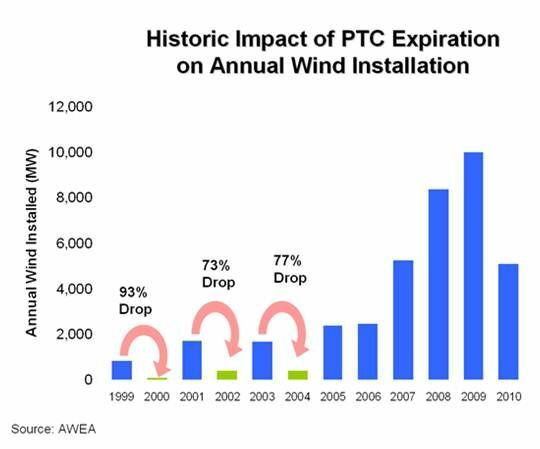 The PTC was initially granted to the wind industry in 1992 as a yearly incentive. Over the years, its extension was periodically the subject of political infighting. Installed capacity in 2000 dropped 93 percent when extension of it was delayed in 1999. Production dropped 73 percent in 2002 when that happened in 2001. And it dropped 77 percent in 2003 when it happened in 2002. The 37,000 jobs lost and $15.5 billion investment numbers cited in the AWEA letter came from a study by the nonpartisan research firm Navigant. Its methodology was valid, an NREL researcher in the same area told GTM, and its conclusions were entirely reasonable. Some observations from experts in finance at a recent wind industry forum looked at variables that could affect what was an entirely hypothetical phase-down at the time. They include the price of natural gas, the potential for a significant change in interest rates that alters the equations on which economic analyses are done, and the nature of state mandates and the associated utility demand. A wind industry veteran said that it comes down to having a push and a pull. The PTC was instituted in 1992, he recalled, but it didn’t start really driving growth until state RPSs were widely instituted after 1999. That, he said, added demand to the return developers could expect from providing supply because of the PTC. At present, load is flat due to economic stagnation, excess capacity, energy efficiency improvements, low natural gas prices and the filling out of many state mandates. Technology advances will continue to grow efficiencies. But an economic recovery could grow demand, put excess capacity to work, and drive the price of natural gas up. And state legislatures may increase existing mandates, all of which would increase wind’s return. Check GTM’s ongoing look at how solar might fare without its investment tax credit.